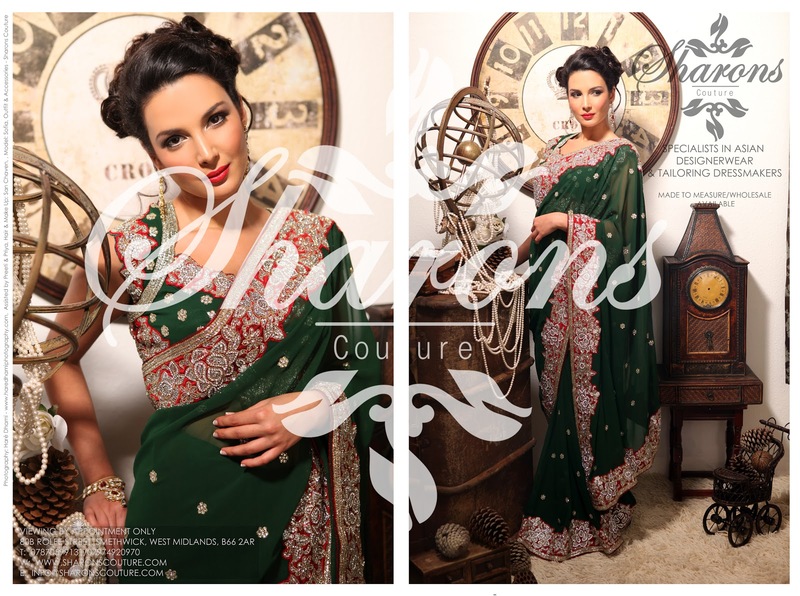 Sharons Couture is proud to announce the launch of its bespoke made to measure saree collection in for 2013. At Sharons Couture we exclusively offer a bespoke made to measure design service in house where by upon your personal appointment you can sit down with us, plan your outfit, pick the fabric, embroidery & together sketch your dream outfit. 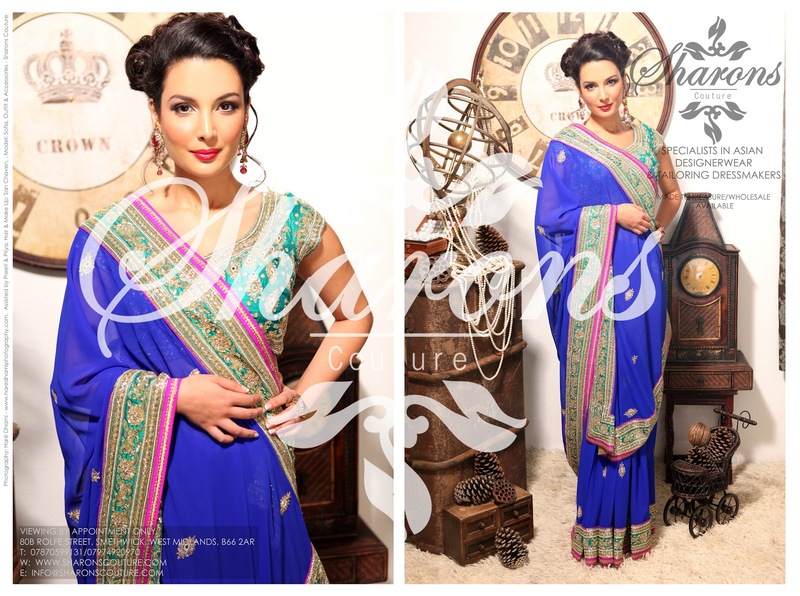 Within our latest saree collection we have introduce traditional fabrics with a modern twist of embroidery. Introducing elements of pearl, diamant stones and parts of tradition with use of ghota & brocade. In our latest collection not only can you alter the outfit to your requirements you can pick & chose the embroidery, the style of the blouse, neck line, dupatta, colour etc. 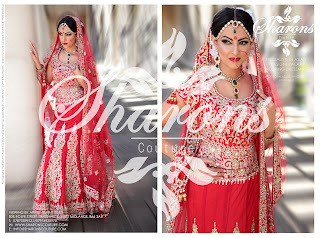 Photography by Haré Dhami - www.haredhamiphotography.com & make up by San Chaven MUA. This month's winner was Sonia from Wolverhampton whom created her bespoke wedding reception outfit at Sharons Couture. After the success of Sharons Couture's first ever exclusive 3 day sale back in April, we decided that every 6 months upon season ends we would hold a bi-yearly sale to mark the next season. This time round we are holding a 2 week sale starting Monday 29th October till Monday 12th November, by appointment ONLY on a first come first served basis. Sale includes 20% off bridals, lenghas, sarees, suits, dresses, chldrenswear, menswear & accessories including jewellery, handbags & shoes. Sale does not include any collections from 2012 summer collection aswell as nothing on the made to measure range, alterations & tailoring are not including on any sale items. No items can be reserved & once an item has been sold it cannot be exchanged or refunded. 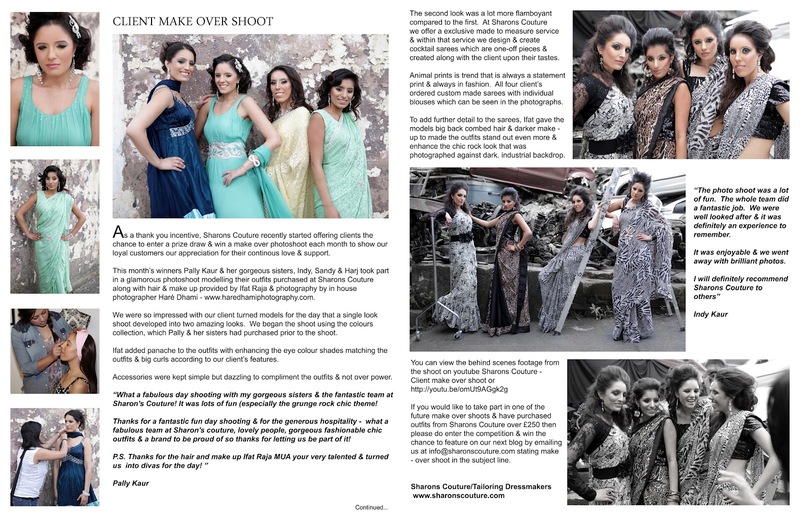 Earlier this month, Pally Kaur & her lovely sisters were the first winners of the client make over shoots. 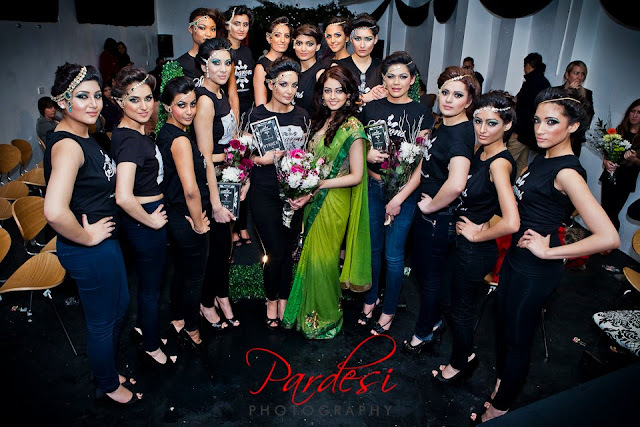 With hair & make up provided by Ifat Raja, photography by Haré Dhami - www.haredhamiphotography.com - the girls were transformed into high couture models for the day. If you have purchased an outfit from Sharons Couture over £250 then don'f forget to enter & win a make over shoot compliments of Sharons Couture. From our latest collection not only can you alter the outfit to your requirements you can pick & chose the embroidery, the style of the blouse, neck line, dupatta, colour etc. View our latest collection online at www.sharonscouture.com, alternatively view a peak below. What to do with your Bridal Outfit - after your big day??? So you spent over a year looking for that perfect outfit, countless visits to various design houses, boutiques & designers, it cost you a months salary but you wanted something amazing for your BIG DAY. 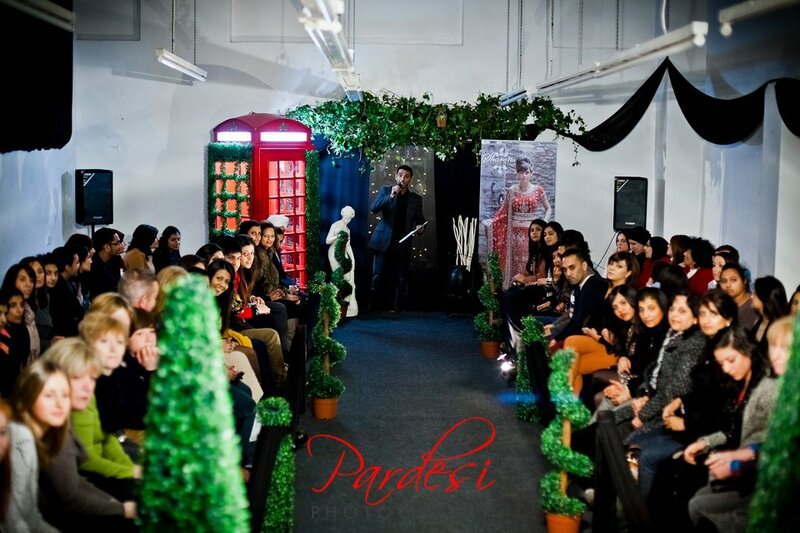 Hundreds of guests admired your outfit, talked about it & wanted it however what can you do with it next????? Like many brides that outfit remains in the back of your closet in the garment bag for the future years, you might wear it once again at an occasion but feel everyone has already seen you in it! We get many clients whom question if their bridal outfits can be made into something as you have spent a lot of money on it & hate for it to never see the day light ever again. At Sharons Couture/Tailoring Dressmakers we have the solution with our specialist in house tailoring/alterations service we can help recycle your outfit & design you a brand new one. Can be converted into an Anarkali with matching pajami & altered dupatta. Convert into a dress with matching pajami and altered dupatta. 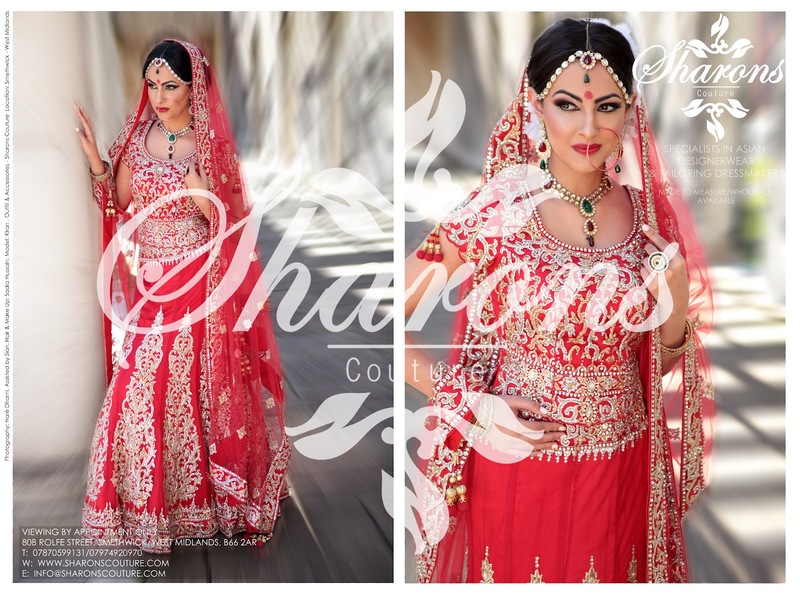 Above are just examples of what can be made of your bridal outfits, to find out further details why not book an appointment at our warehouse studio by contacting on either 07870599131 or 07974920970 & enquiring about the available services. 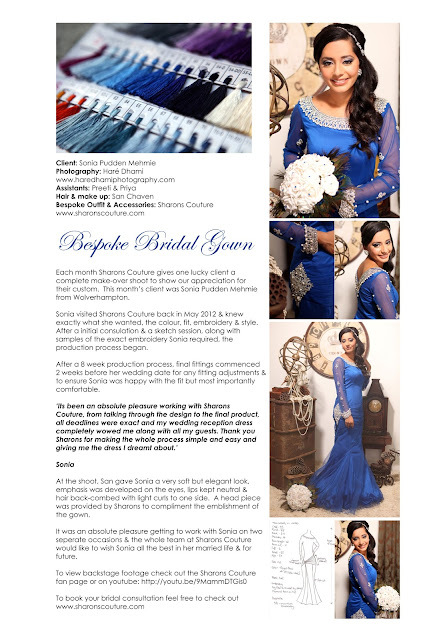 The Sharons Couture Exclusive Bespoke Bridal Wear Collection for 2013 is now available on made to measure. View our Brand New Bridal Collection on our website - www.sharonscouture.com alternatively view a exclusive video shot by Haré Dhami - www.haredhamiphotography.com featuring samples of our current designs. As a thank you incentive, Sharons Couture will be offering all clients the chance to enter a prize draw & win a Make Over Photo Shoot each month modelling your purchased outfit & appearing on our website/blog site with your new look/experience. 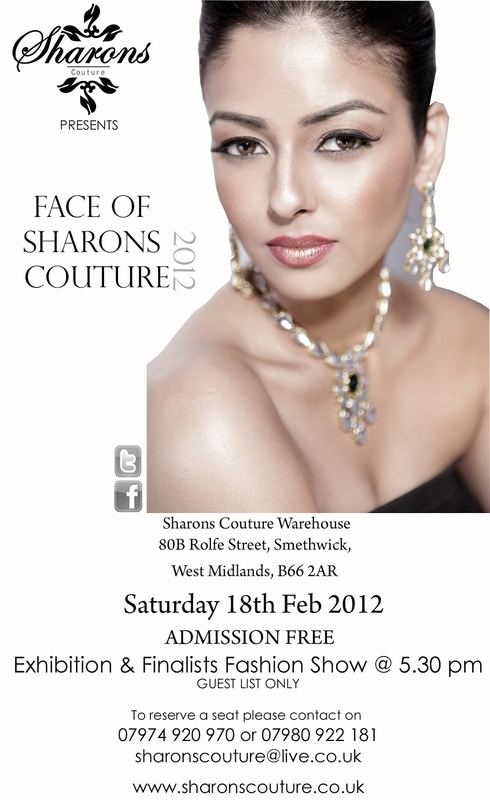 Hair & make up will be provided by the Sharons Couture in house talented creative team. A day at our studio being pampered all day & experiencing a professional photo shoot (free of charge). 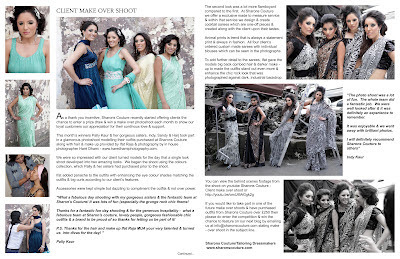 Being photographed by published photographer Haré Dhami - www.haredhamiphotography.com whom currently produces/styles all the Sharons Couture website/promotional shoots. Appearing on the Sharons Couture website/blog site. Recieving copies from the photo shoot on CD for you to show your family & friends (free of charge). Once lucky member will be picked out at random each month, so if you have purchased a outfit at Sharons Couture whether ready made or made to measure don't forget to fill in your details & enter today. You do not have to be a professional model to enter the prize draw as we want our real clients showcasing their purchased item & their experience at Sharons Couture. Applicants must be 16 & over or accompanied by an adult if under the age of 16. The prize can not be exchanged for money. The prize is only available for the client that has purchased the outfit or for whom they have purchased it for. 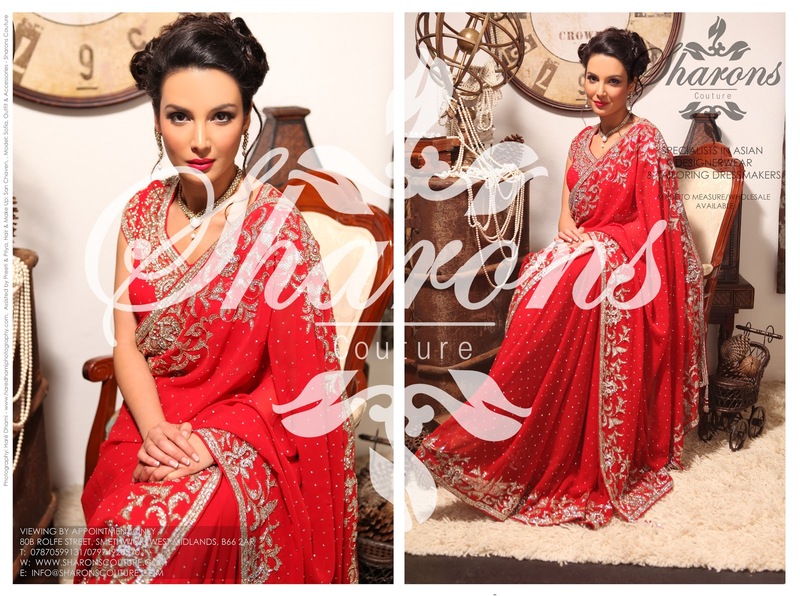 Only the outfit by Sharons Couture can be worn at the Shoot including jewellery. 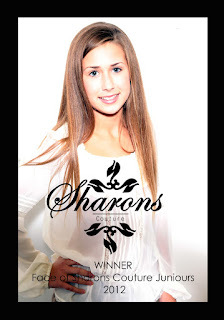 Applicants must provide a testimonial of their experience at Sharons Couture & at the photo shoot. Be prepare to be photographed/interviewed as part of the incentive. The images from the shoot can only be used for personal use & not that of promoting other goods except Sharons Couture. Only the MUA (Make Up Artist) & Hair Stylist provided on the photo shoot can be present & not the clients own. Any cancellations/withdrawals will be done in writing. Applicants will be picked at random each month & the photo shoot will normally commence on a weekend. Sharons Couture is proud to introduce our latest in Bridal Gowns - ideal for registry weddings or for receptions. Available in made to measure to suit your taste, we can design with you & pick the colour, add sleeves, a slip or duppata. Also available for bride maid's made to measure accordingly to your colour scheme. We are also proud to announce our new summer collection now in stock. Photographed by Haré Dhami (www.haredhamiphotography.com) modeled by our current face of the brand Sofia. To book an appointment you can contact us or if you wish to book an appointment for our made to measure service which is now also available to public you can do so. Apologies firstly for not being blogging recently but we have been so busy with the wedding season. We hope you are well and enjoying the odd occasions of sun when we do get them. Anyway we are proud to announce that our new website is up & running - feel free to browse it & if you have any enquiries etc please do get in contact. We hope you are all doing well and looking forward to the coming wedding season, we know many of you are getting married this year or attending weddings/parties. 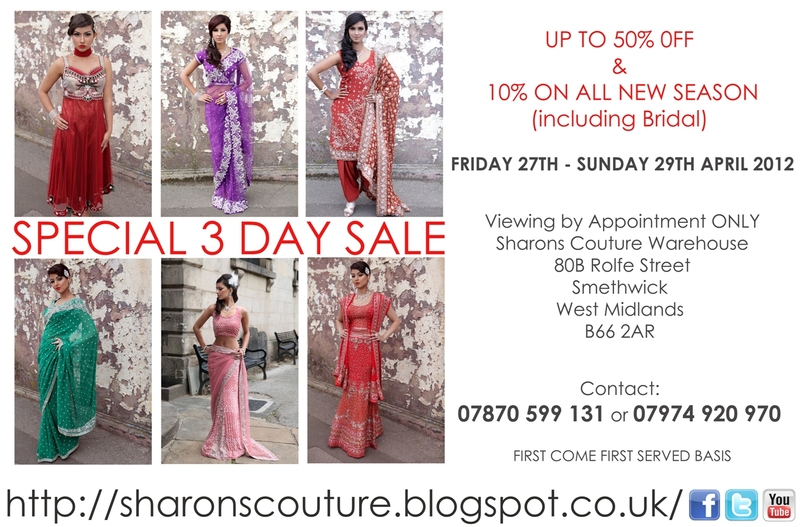 As many of you may know here at Sharons Couture we hardly ever have a sale, therefore for the first time ever we will be holding a Special 3 day SALE at our warehouse in Smethwick, next weekend - Friday 27th - Sunday 29th 2012. Many items will be up to 50% off and all New Season will also have a further 10% off including childrenswear, accessories & even bridal wear. Viewing is by appointment - every hour so book your slots now to avoid disappointment. 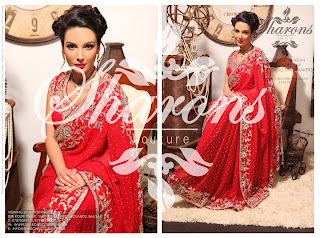 Sharons Couture is proud to present in 2012, launch of custom made sarees to order. 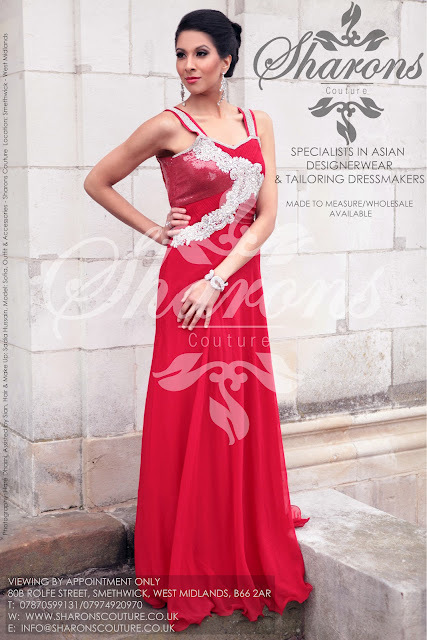 Only available at Sharons Couture/Tailoring Dressmakers. You can select your saree fabric from our vast collection of saree fabrics, your saree blouse fabric with embroidery & its style - custom made to your requirements. Price vary as these are made to your order & your requirement. 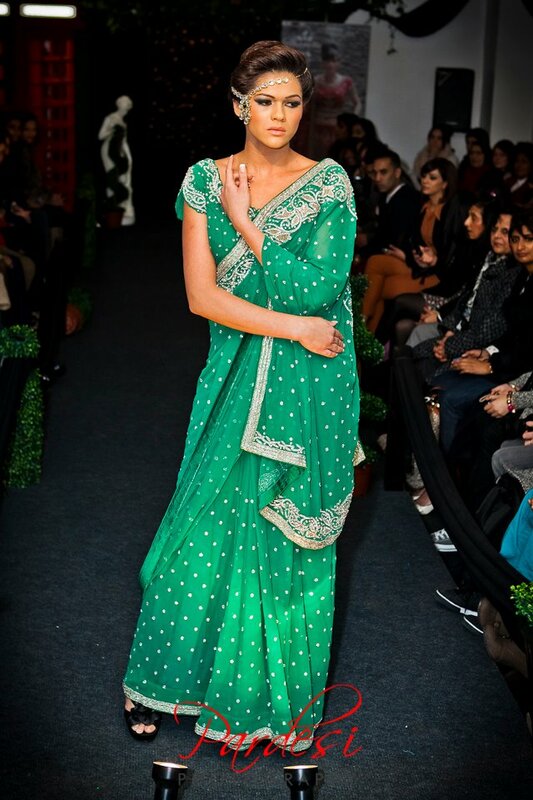 Fancy a saree that is just one off then why not contact us on 07870599131 or 07974920970 & book an appointment today. 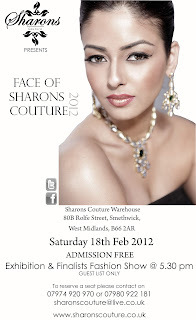 Face of Sharons Couture 2012 Finals Fashion Show commenced last night at the Sharons Couture warehouse in Smethwick. 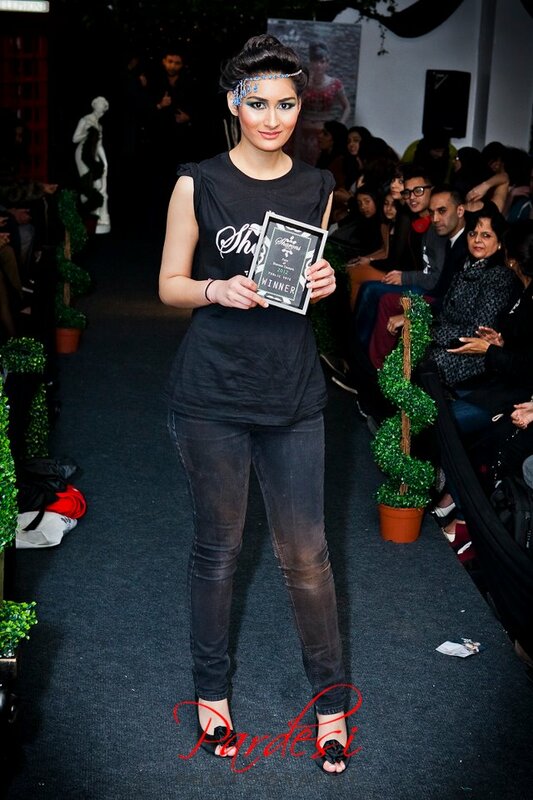 Hosted by Haré Dhami, an amazing catwalk took place on a London Notting Hill inspired runway. Showcasing exclusive outfits & accessories by Sharons Couture, 15 finalists added glamour to the runway with hair & make pp created by Ifat Raja & her team, photography by Pardesi Photography, video production by BCU Media & opening dhol playing by Dholblasters. The Official Judges for the night Ami rai, Arman Milind, Blaise Johal, SonnyJi & Fahmina Chaudhury announced Sofia Zolghadriha the winner of Face of Sharons 2012. Sofia a student at Birmingham university is of Iranian origin whom speaks 3 different languages including English, Swedish & Persian. "I am inspired & influenced at how the Sharons Couture Team treat the business & models involved as their family" Sofia answered to one of questions asked by the Judges. 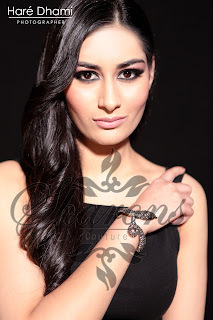 As part of winning the title of 'Face of Sharons Couture 2012', Sofia received an exclusive designer outfit by Sharons Couture, a portfolio shoot with Haré Dhami, a featured role in a commercial for Sharons Couture & will be featured in all of the 2012 campaigns, magazine shoots & advertising. 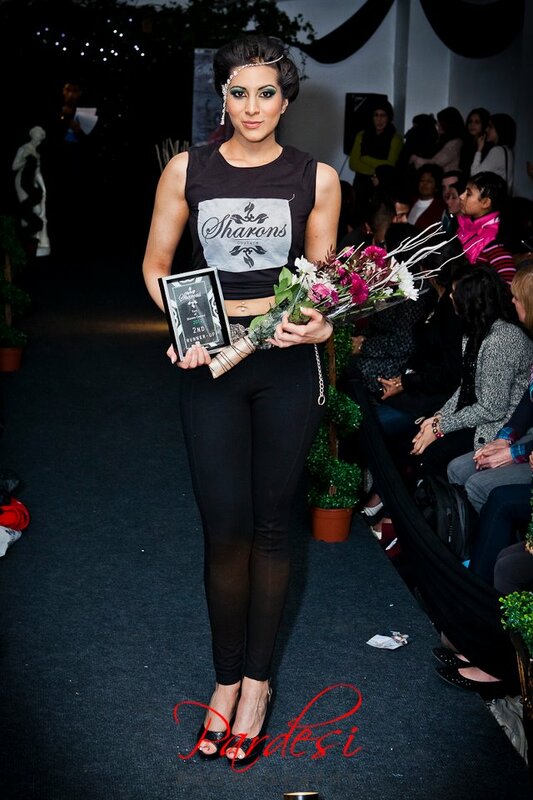 Runner Ups for the Face of Sharons Couture title included 1st runner up Bárbara Guimarães, 2nd runner up Jaya Nayyar & winner of public votes this year was Amina Kazi with 1035 votes. 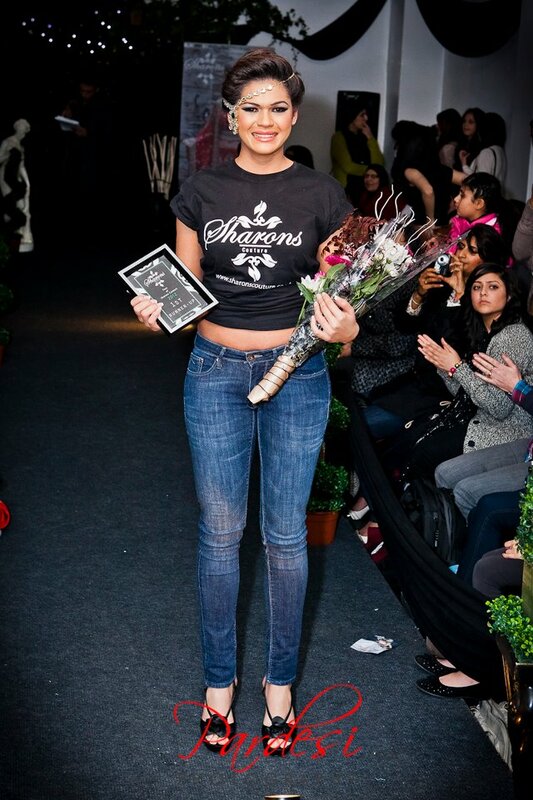 All runner ups have also won portfolio shoots with Haré Dhami & will feature in future shoots for Sharons Couture. Finally we would like to wish all the finalists whom took part in the competition last night & would like to thank them all for their professionalism & we wish them best of luck their futures & give them the assurance that the team at Sharons Couture will always be there for them for any advice/guidance. 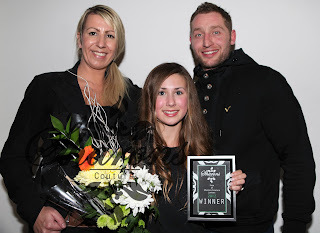 Bethany Jade Fenton was the first winner ever last night of the Face of Sharons Couture 2012 Juniors Division Model Competition. Bethany whom is 12 years old from Chesterfield managed to impress the judges with her presence on the catwalk and her bubbly personality. "we are over the moon with Bethany winning the Face of Sharons Couture juniors, we still can not believe it, she is really looking forward to the photo shoot"
Bethany will be taking part in future shoots for Sharons Couture children's wear & as part of her prize for winning the title Bethany received an outfit from Sharons Couture along with a model portfolio which will be shot by Haré Dhami. Finally we would also like to thank all the finalists whom took part in the competition last night & would like to thank all the parents & guardians for supporting the junior finalists. With the anticipation building towards whom will win the title of Face of Sharons Couture 2012 Model Competition on the Weekend. We are proud to announce our official judges for the evening that will be narrowing down the finalists and determining whom will represent the brand for the whole year. Having worked as a creative stylist for Asiana Magazine& Mantra Magazine just to name a few, Ami as a unique eye for fashion and a distinct eye for new faces has started off many young models careers. A perfect choice to help determine our winner this year. Arman’s work has graced the pages of many publications, having worked with celebrities, models, TV personalities and brides; Arman knows a good face when he sees one. Creator of channel UBTV producing original serials and Director of over 100 music videos. Blaise will use his experience of casting models to help crown the winner. 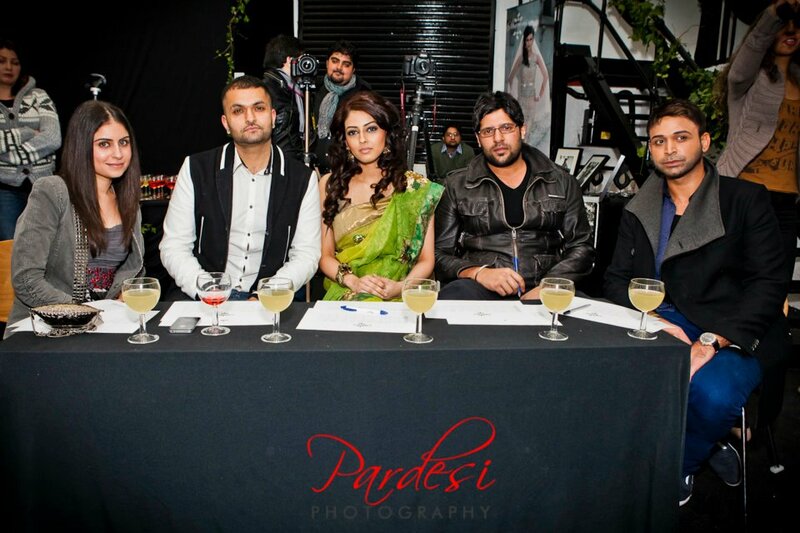 BBC Asian Network Radio Presenter of Sat mix show, DJ & TV/Radio Broadcaster.